Homeowner grade wheelbarrow, 5 cu. ft. seamless steel tray, 55.5 in. square hardwood handles, 2-ply 14 in. pneumatic tire with inner tube, 5/8 in, steel axle with nylon bearings. From mulching to general cleanup, it is the perfect size for lots of jobs around the house. It's small enough to be easy to use but big enough to get the job done. Multi-use telescoping tool with excellent accessibility to tree crowns and dense bushes. Trim overhead without a ladder, or at ground level without bending or kneeling! It very safely and easily trims branches located up to 5.5 metres (18 feet) high. Power-Lever technology maximizes leverage for up to 2X more cutting power. Includes one fully hardened, precision-ground steel pruner and one sturdy 15" WoodZig saw. Oval-shaped pole greatly reduces flex, allows you to control the direction of the cut and fits the natural shape of your hand for improved comfort. Chain-drive gearing mechanism gives you up to 3X more cutting power than traditional designs. Includes one fully hardened, precision-ground steel pruner and one sturdy 15" WoodZig. saw with hooked end. Oval-shaped pole greatly reduces flex, allows you to control the direction of the cut and fits the natural shape of your hand for improved comfort. Better quality Constructo<sup></sup> sprayers are an outstanding value. Galvanized steel tank epoxy-coated inside and out with high quality brass pump. Features steel D-handle, Viton<sup></sup> gaskets & seals, and Poly Thrustless control valve with brass wand. Poly units have translucent corrosion resistant tank, polyamide pump and same features as steel units. 5 cu. 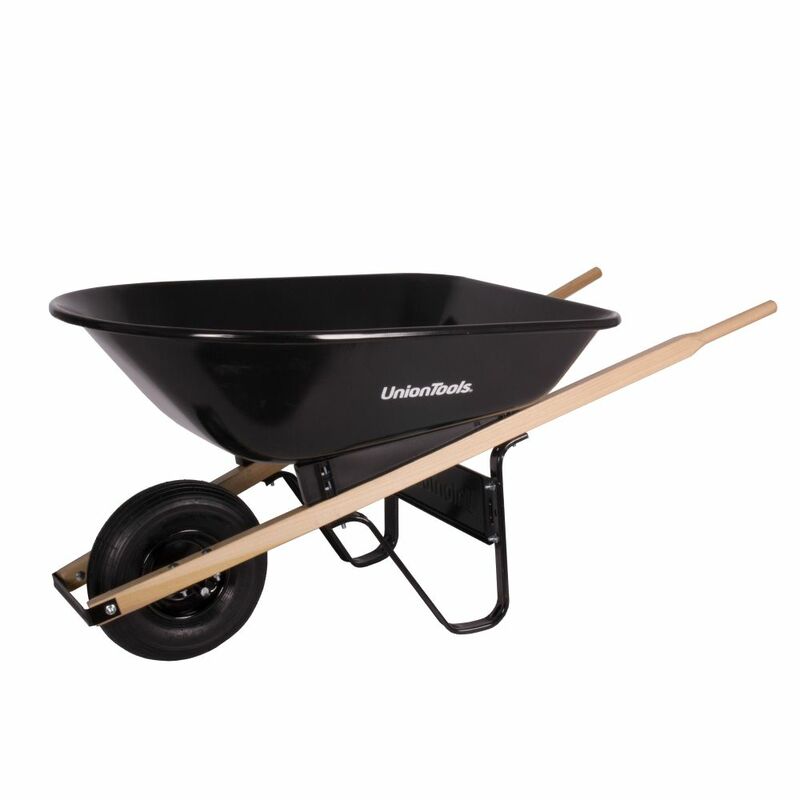 ft. Wheelbarrow with Steel Tray Homeowner grade wheelbarrow, 5 cu. ft. seamless steel tray, 55.5 in. square hardwood handles, 2-ply 14 in. pneumatic tire with inner tube, 5/8 in, steel axle with nylon bearings. From mulching to general cleanup, it is the perfect size for lots of jobs around the house. It's small enough to be easy to use but big enough to get the job done. 5 cu. ft. Wheelbarrow with Steel Tray is rated 1.0 out of 5 by 1. Rated 1 out of 5 by NotHappy from Terrible product I bought this product last fall. This spring my wife used it in her gardening project. She piled on the dirt and picked up the handles. One of the handles snapped in half hitting my wife. The website lists 1 year warranty, so I called the manufacturer, they told me they only honour 90 days warranty. Buyer beware.